You should tell the yankees to correct their history page that states their name was changed in 1913. oh wait, didn’t they fire you too? Why does this article end suddenly? Is it just me? When I first started loving baseball, I read a book about the first century of the Yankees and it called them “The Highlanders” too. However, the first day my daughter returned home from her first experience of college, she asked, “Guess what I learned?” I couldn’t wait to hear! Answer: “Never to believe anything you read.” I was thrilled! Great, as usual, Keith! Nobody does a blog better! It was just me. Sorry. Seeing Pumpsie Green, who integrated the Red Sox in 1959 (becoming the last of the original 16 to do so) but I wonder if Gene Conley showed? He not only played for the Sox, but for the Boston Braves AND the Boston Celtics as well! Yes, the nicknames back then were anything but permanent (and usually bestowed upon a club by the newspapers), so it’s likely that they were known as both the Highlanders and Yankees in 1912. The Yankees’ own website puts the official adoption of “Yankees” as April 1913, when they moved to the Polo Grounds: http://newyork.yankees.mlb.com/nyy/history/timeline1.jsp (then click on 1910s). The Red Sox should have kept the name “the Americans.” Who’s going to say “I hate the Americans!”? I was reading about the first game at Fenway. The crowd was on the field at game time so new groundrules had to be made– all hits were two bases. The Boston Globe article said this gave the “Highland laddies” an advantage because most of their hits were singles (unlike Swish and Chavez) while Boston was hitting home runs into the crowd that just counted for two base-hits. The all white hats look pretty bad. Is this the first time Jeter has worn his socks up like that? At any rate, the Yankees didn’t become the Yankees until Babe Ruth got there. Can anyone pick out who’s who in that 1907 picture? Is that “Wee Willie” Keeler standing on the right? “Happy Jack” Chesbro sitting on the left? Hal Chase sitting 2nd from left? Branch Rickey was also on that team, but I don’t think he’s in the picture. Clark Griffith might be in there too, probably one of the guys sitting at top. Here’s another example. The then-Brooklyn Dodgers weren’t officially known as the Dodgers until 1932, even though that had been one of their nicknames for many years (it had originally been hung on them by a Washington sportswriter who was also responsible for hanging the expression “First in War, First in Peace and Last in the American League” on his city’s team. I found an article in the Brooklyn Eagle from that year that talks about how team ownership sat the local writers down in a room and asked them to come up with a name. After a while, “Dodgers” won and “Kings” came in second (Brooklyn is also Kings County). Would the NHL team in Los Angeles have a different name if the Los Angeles Kings had moved west after 1957? The NY team 100 years ago was the Highlanders AND the Yankees. One team, two names. Baseball Nuggets: Fenway Park Opener – 1912. While team nicknames were oddly flexible in the pre-WWI era, with team owners and scribes often varying wildly in what they called a given team, even later periods would undergo some nickname flux. The Braves also had the brief “Bees” period back in the late ’30’s. Unlike the Phillies brief “Blue Jays” experiment in the mid-40’s, it was actually official. They even referred to Braves Field as the Bee Hive during that time. But, even though it was nice and short for the headline writers (and nowadays, would be far more politically correct), “Bees” never caught on. Probably just as well. I can’t picture Hank Aaron or Dale Murphy with Bees on their uniforms. I really enjoy all of the history too. And your encyclopedic knowledge of baseball is nothing short of amazing, Keith. 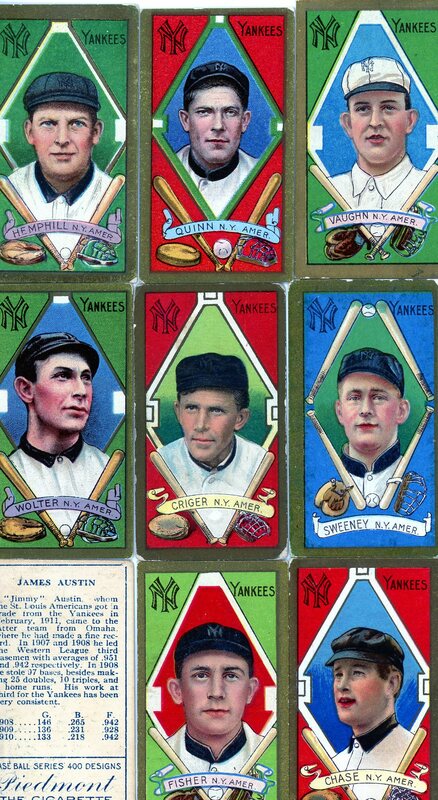 The baseball cards are striking, but they sure were heavy-handed with the ink or coloring in 1911. The boys look like they’re wearing lip and cheek rouge. Yikes. Know what this whole thing reminds me of? Of how Saturday Night Live started out as NBC’s Saturday Night, but so many people just called it “Saturday Night Live” (even though there was another program called “Saturday Night Live with Howard Cosell” on ABC that pretty much nobody watched and was nothing the same) that as soon as the Cosell show went off the air and wasn’t using the “Saturday Night Live” name anymore, NBC grabbed it and formally renamed the show what everyone was calling it anyway. Not that this relates to baseball, but still. Well, aside from those “Beisbol been bery bery good to me” sketches. It’s easy to find all sorts of articles in the NY Times from the era. 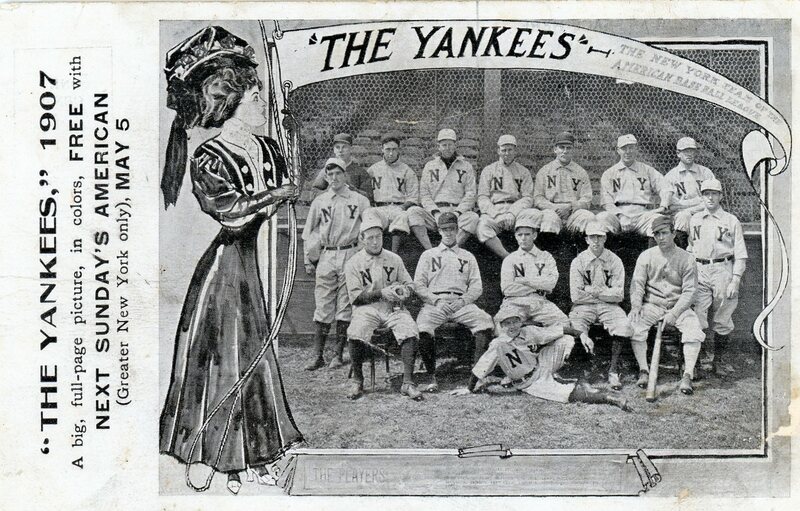 I found a few articles referring only to “Yankees” in 1909 through 1911. And article in 1907 used both names. http://spiderbites.nytimes.com/ (the label says the articles are free, but I don’t know whether they’re behind the paywall). Keith I always enjoy your blogs but it appears that they were called the Highlanders in 1912 just as much as they were unofficially known as the Yankees. The official adoption of the new name in 1913 certainly demonstrates that use of ‘The Yankees’ had become more favorable but anyone who states that they were known as The Highlanders in 1912 is also correct. A rose by any other name still…smells like gym socks. I think we could call these teams anything and still love them. Or still watch them for sure! Excellent – as usual. I love this stuff. I’m a Yankees fan all my life (well six years old onward) and for 51 years have enjoyed the ride. Keith, just keep it up – please!!! I think people get confused because what they were actually called was “New York” and EVERYTHING else was a nickname, coined by sportswriters for descriptive and creative writing reasons. Whether a sportswriter called them “Hilltoppers,” “Highlanders” or “Yankees,” the reader would know that he was talking about the New York Team That Played On The Hill, so he would use the names interchangeably. And apparently the original Washington AL team didn’t *officially* call themselves the Senators until the mid-1950s, after owner Clark Griffith died — before that, they were just as commonly known as the Nationals/Nats. They didn’t even put the Senators nickname on their jerseys until 1959, just before the franchise was moved to Minnesota. Calling them the Highlanders is technically correct. Which is the best kind of correct. Nicknames are irrelevant. If it were 1913, then fine, but that was their official name like it or not. Blabbermouth is a hypocrite who on one hand inaccurately refers to the Yankees referring to the team in that era as the Highlanders as being a misunderstanding, and then a few paragraphs later concurs they are historically accurate. As usual he’s trying to show how smart he is and instead demonstrates the opposite. Can’t stand the guy, and it’s no wonder he was fired, again!! As for putting unofficial nicknames over official names in a ceremony celebrating an historical event, I agree with the Red Sox position of using the official name, given we are living in a politically correct world these days. I’m not one to stick up for the Red Sox, but they got this one right. As for trying to slight the Yankees on their handling of the closing of the old Yankee Stadium, how about pointing out how the Yankees are the role model for all of sports when it comes to recognizing their past heroes with awards, presentations, and celebrations. Their annual Old-timers Day is unlike any other. To say they slight the little guy is an insult to our intelligence. We can now all rest assured that the year 1912 was a year Rachel Maddow will always remember with great love and affection. Thank you for the auspicious writeup. It actually was once a amusement account it. Glance complex to far brought agreeable from you! However, how can we keep up a correspondence?